When you step through the front gate of Stacy Davison’s Maple Leaf home in North Seattle, you enter a lush gardening wonderland. Ornamentals and flowers commingle happily with edible crops. Trellises tower over raised beds – one bordered festively with partially-buried wine bottles – and many labeled with creative hand-painted signs. Wind your way down the flagstone path to the backyard, and you’ll find more verdant richness, plus treasures such as a bunny hutch, a chicken coop with a “living” roof covered in succulent plants, and a former garage converted into a cozy teaching space: Stacy’s one-room Seattle Urban Farm School. 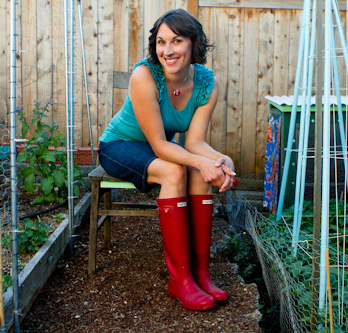 Solid Ground’s Lettuce Link program makes it easy for backyard and P-Patch gardeners like Stacy to donate their extra produce to local food banks and meals programs, getting fresh vegetables onto the tables of families who need them. For about three years now, Stacy has donated 10% of her harvests from her bountiful garden to her neighborhood food bank. Then about two years ago, she says, “I got inspired to teach a class, posted it on my blog, and it sold out.” Initially holding classes in her living room and garden, last winter she transformed her “junky old garage” into her schoolhouse. And keeping in tradition with her commitment to donate 10% of her harvests, she decided to donate 10% of class proceeds to Lettuce Link as well – a natural next step for her. When you see her garden, it’s hard to believe that Stacy, a 5th grade teacher by profession, previously “had no idea what a giving garden was.” But when a friend invited her to a fundraising harvest party in the backyard giving garden of former Lettuce Link Farm Coordinator Sue McGann, she says, “I was enthralled with Sue’s garden, and mine was just taking off. And I remember distinctly coming home and being inspired to start a giving garden of my own as a way of giving back. I was excited!” She immediately wrote a blog post announcing it: “I’m going to be a giving gardener!” Then she began to plot out which beds she’d use to grow extra food to donate to her local food bank via Lettuce Link. Even now, she says, “Donating food can be challenging. When you spend a lot of time growing it, there’s a tendency to want to…” she hesitates a moment, “…not hoard it, but enjoy it. But I’m fortunate to be in this place now, and to have a space where I can grow my own food. This is my passion and love in life. 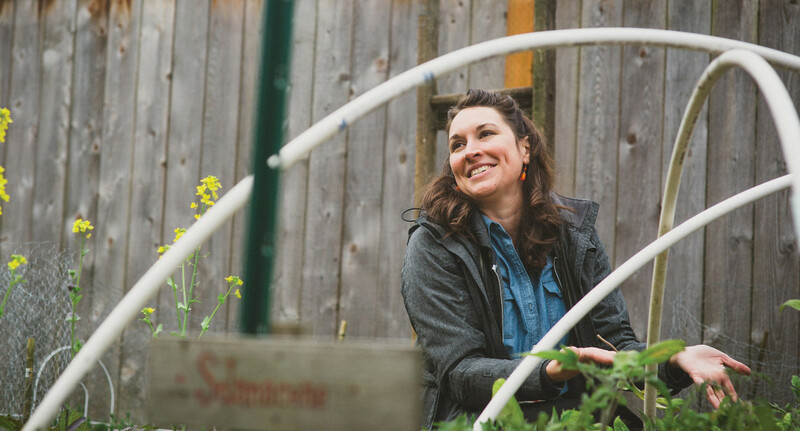 When she started teaching classes, Stacy says, “I realized my teaching skills plus my passion for gardening came together, and I came alive more than I have in a long time.” In her first year as a giving gardener, “I donated about 10% of the total pounds that I grew. So that’s been my mark: 10% of Farm School proceeds go to Lettuce Link – money and food to people who need it. Setting a goal for myself, it’s sort of like making a direct deposit. Making the transition from volunteering to also being a donor “felt really manageable to me. I believe in the organization. Donating monetarily has allowed me to feel like I’m still contributing, even when my harvests aren’t strong or I’m not able to participate as actively because of time. I want to do my part to support it in whatever way I can,” she says. ‘Sharing in the goodness’ is the lead article from Solid Ground’s September 2014 print newsletter for our friends and supporters. Sign up here to get email updates and/or receive the entire newsletter by snail mail! 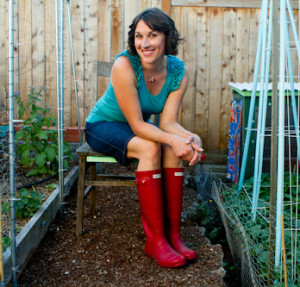 Visit Stacy’s Seattle Seedling blog & Seattle Urban Farm School website for more info on her efforts.